The amps were boxed in, probably because of sun protection. Catwalk, what do you mean? Newbie Q : don't tube amps fear everything but heat as they generate a copious amount of heat themselves? Maybe the screens were a cheap way to give the stage a classy look? Could very well be, but they didn't continue that allegedly «amp-make up» for the euro tour..
You can see the protection (not screens) in the pic I posted, right? Do we have pic with Mick using that ladder / standing on top of the amps? For some reason I can't see DPs photo at all. By switching browsers I was finally able to see the photos at the link Doc provided. The ladder is visible in a few of the pictures and it does look very similar to a ladder used on the side of swimming pools. I believe that covering the backline in white was a visual concept : trying to make the band visible by having a clean white background on stage. 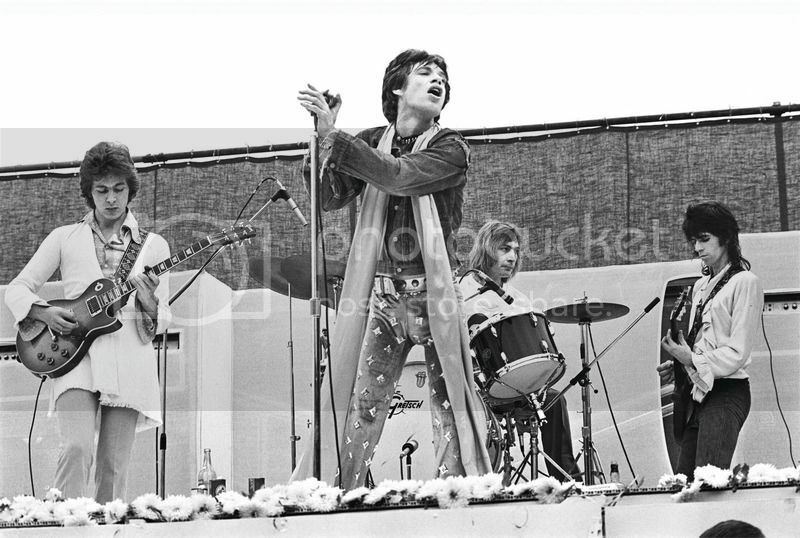 The gigs were outdoors and daylight gigs, So a clean white background made the band more visible to the audience. But there were night-time gigs too - the Sydney gig was at night, wasn't it? Or were there two shows per day - an afternoon show and an evening show? Would love to see some colour photos from the Sydney show but I don't think they exist (I've never been able to find any). you do know that throughout the 70's and into 81/82, they played many, many daytime outdoor gigs? Stadium shows back then were more often in the daytime. I don't know what it has to do with debauchery or drug use. Keith's skin back then says it all. Those guys were vampires. I can understand playing an indoor arena in the daytime but they literally didn't see the light of day. After staying up for a few days partying would any of us want to play a rock gig in broad daylight? I wouldn't. You can see the same stage set up in the Nic Ben Concert photos a few weeks earlier. I have a vague memory of Jagger walking along the raised light-lined walkway at that concert. It appears the amps have the same covers. Check out "Nicaraguan Benefit Concert Images."